The Hyundai Starex is a van built by the Hyundai Motor Company in South Korea and Indonedia. First generation models were known in Europe as the Hyundai H-1 and as the Hyundai H200 in the Netherlands. For the second generation, Australian and UK market models are sold as the Hyundai iLoad (cargo version) and Hyundai iMax (people mover version), and in Continental Europe as the Hyundai i800. 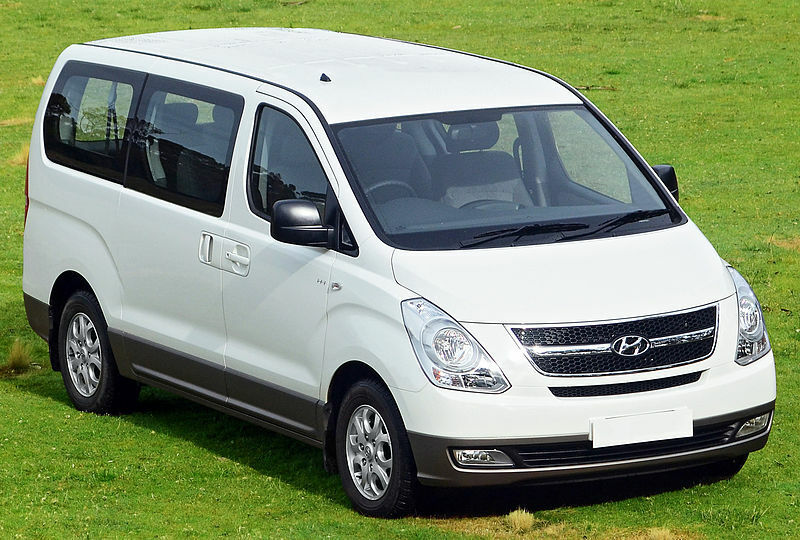 European models, like those in Australia are differentiated as the Hyundai H-1 Cargo (cargo version) and Hyundai H-1 Travel (people mover version) in The Netgerlands it's called Hyundai H300. The People mover version of the H300 is for fleet only. Starex is also produced in China under the name JAC Refine by Anhui Jianghuai Automobile since 2002 under Hyundai licence. It is very successful, with a market share of about 20%. From 2003 to 2008, it has consecutively won "Year's MPV" and "The Best Official Car" from 2004 to 2008. In 2007, it was gained "The Best MPV" and "The Best MPV for Government". The Starex succeeded Hyundai Grace in most countries. 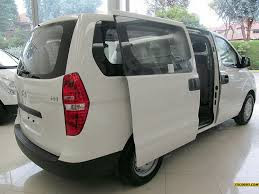 Like the Hyundai Grace, the first generation Starex was based on Mitsubishi Delica and was offered available in a wide range of configurations, including minivan (MPV) and minibus, van, pick up, taxi, and ambulance. It had used a 2.5 SOHC 8-valve turbodiesel engine that has an output of 85 horsepower (63 kW) at 4000 rpm and 170 nm of torque. It offered ABS, LSD and an optional 4-speed automatic transmission, back up sensors and a driver's airbag. It has 10- or 12- seat configuration. Starex/H-1 2000 version offered much more with a new front fascia, a new 2.5 DOHC 16-valve commonrail direct injection turbo diesel engine that had an output of 123 horsepower (92 kW) and 360 nm of torque. The 3rd generation sports an all new body and two engine types: a base 2.5SOHC 8-valve turbo diesel engine with 110 horsepower (82 kW) and 232 nm of torque and another 2.5DOHC 16-valve commonrail direct injection with variable geometry turbo with a class leading 174 horsepower (130 kW) and 402 nm of torque. Top of the line model features a leather interior an overhead console and immobilizer. Aluminum accents, split, folding seats, all power features, climate control, keyless entry and DVD player with 6 speakers are standard. The 2nd-generation vehicle was introduced as the Grand Starex with larger dimensions and much stronger CRDi engine. The CRDi engine is a 2.5-litre in-line 4-cylinder with Variable Geometry Turbocharger (VGT) delivering 167 hp (125 kW; 169 PS) at 3,800 rpm with 289 lb·ft (392 N·m) of torque between 2,000 and 2,500 rpm. In Malaysia the Starex is available in a more luxurious variant with DVD player, 7-inch LCD panel and fully equipped with body kit. Called Grand Starex Royale the vehicle won many car awards such as the Autocar Asean 2008 for Large MPV category, 1st Place in Asian Auto Bosch Fuel Efficiency 2008 in Luxury MPV Category with a combined fuel efficiency of 8.5l/100 km as well as the New Straits Times / Maybank Car of the Year Award in the large MPV category. The vehicle is also sold with the longest warranty in Malaysia spotting a 5 Year, 300,000 km warranty. In Indonesia, Hyundai Starex is available with the name Hyundai H-1. Hyundai H-1 is introduced in 2008, with 3 options: GLS, Elegance, and XG. At first, only petrol engines is available for H-1. The diesel engines came in February 2010, when Hyundai decided to produce H-1 in Indonesia for ASEAN market. In Indonesia, one of H-1's competitor is Toyota Alphard. It also competes with Toyota Hiace in the Philippines. In Thailand, the Starex is marketed as the Hyundai H-1. It comes in three variants, the Touring, Executive and Deluxe. All come with 12 seats. The Executive and Deluxe were badged as "Maesto" until a minor change in 2011. The Grand Starex "VIP" variant based on H-1 with 7 seats and a 2nd-row "Double VIP" seats that can electrically control on recline and leg support and 19-inch TV and DVD player are available in late 2010, and then Grand Starex "Premium" with sliding "Double Super VIP" seats on 2nd row and smaller 10.2-inch DVD player screen available in late 2012. Hyundai Tiên Phong giao ngay xe Hyundai Starex Bán Tải 2014 hoàn toàn mới. Giá bán Hyundai Starex 6 chỗ bán tải ưu đãi, giao xe ngay khi khách hàng có nhu cầu. Amazing post! this blog is very useful and informative for other people. Faniani Coaches bus rental service is a leading transportation company, providing coaches, buses and minibuses at affordable prices. We offer modern, comfortable and safe coaches within Swiss and other European countries.